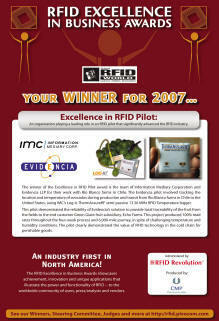 A pilot conducted by Evidencia LLP using Information Mediary Corp's Log-ic Temperature Logger received the 2007 �Excellence in RFID Pilot Award� At the 5th Annual RFID World Conference's RFID for Business Excellent Award Event recently. This award recognizes the Log-ic team as playing a leading role in an RFID pilot significantly advancing the RFID industry. The RFID Excellence in Business Awards showcase achievement, innovation, and unique applications that illustrate the power and functionality of RFID -- to the worldwide community of users, press/analysts and vendors. The awards were presented recently at RFID World 2007, the industry's premier exhibition, conference and networking showcase in Dallas, Texas. The award submissions were judged by an industry expert panel consisting of Wolf Bielas (RSI ID Technologies), Kevin Brown (Daisy Brands), Tali Freed (California Polytech), Paul Freedman, (Best Buy), Steve Georgevitch (Boeing Integrated Defense Systems), Ann Grackin (Chainlink Research), Ed Hess (Integrated Solutions Magazine), Sue Hutchinson (EPCglobal USA), Chris RFID Lyons (RFID Product News Magazine), Jim McMasters (Tandy Brands), Dan Mullen (AIM Global and Chairman US Technical Advisory Group for ISO/IEC SC31), Andy Price (IATA), Reik Read (Baird's Supply Chain Technology and RFID), Andy Schmidt (Sun-Maid Growers), Will Smiths (RFID Update), Peter Spellman (SupplyScape Corporation), and Mary-Ann Wagner (XIO Strategies). Log-ic Class 3 RFID Temperature Loggers facilitate immediate information gathering about shipments or warehoused goods with a simple swipe of a standard CertiScan RFID wireless reader. An upcoming CertiScan web support function will make such data available instantly for review and action from anywhere in the world. Throughout the past year, Log-ic Thermassure RF Loggers have been tested extensively in early adopter trials for transoceanic monitoring with industry leaders such as Sanofi, La Croix Rouge (French Red Cross), Pandol Brothers, Capespan, The University of Florida, Rio Blanco and many others. Log-ic Thermassure RF Loggers are light (only 6 g, 5 cm square small, and 3 mm thin) RFID sensor tags capable of maintaining a 4000 point temperature log in its onboard memory. It is offered in calibration ranges from � 0.2 to � 1 Centigrade, both as single-trip disposable as well as re-usable versions. Log-ic Thermassure RF Loggers can be programmed and their data collected via the CertiScan wireless 13.56 MHz RFID solution. "Log-ic Thermassure RF Loggers are the only qualified RFID temperature loggers eligible for airfreight under FAA rules" states Dr. Jean-Pierre Emond, Director of the Center for Food Distribution and Retailing at the University of Florida. A handheld data collection device with up to a 400 meter range from any assigned base station is available to select customers. Log-ic Thermassure RF Loggers and CertiScan RFID reader systems are available for commercial orders now. Evidencia is the leading provider of semi-active RFID temperature sensing and tracking solutions as well as a specialist in more traditional data logging equipment. Established in 2002, Evidencia supplies traceability solutions to perishable, food and life science industries worldwide. Information Mediary Corporation�s team of smart packaging experts have developed a variety of RFID sensors and IAP (Intelligent Active Packaging) products, such as the Med-ic Digital Package, Logic Temperature Trackers, Log-ic ECM (Electronic Content Monitors), and the secure CertiScan 13.56 MHz RFID data exchange solution. Copyright � 1996-2007, VertMarkets, Inc. All rights reserved.